This is plate 4 of Robert Melville Grindlay's 'Scenery, Costumes and Architecture chiefly on the Western Side of India'. Grindlay (1786-1877) worked for the East India Company and was an artist in his spare time. 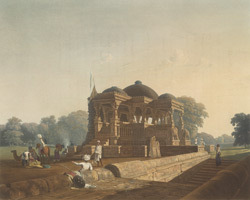 During his stay in India, he made a collection of sketches and drawings. Halvad was the former capital of Dhrangadhara state in Gujarat and was ruled by the Jhala Rajputs. It is an ancient fortified town at the southern edge of the little Rann of Kutch. Halvad has four step-wells and six temples devoted to the Hindu god Shiva. The Bhavani temple and the Bhuteshwar Mahadev temple at the cremation ground are thought to be at least 500 years old. According to Grindlay, the temple shown in this plate is dedicated to Shiva in his role of regenerator. In the foreground is a step-well. Grindlay commented: "These subterranean reservoirs present, throughout Guzerat, some of the most splendid specimens of architecture, combining utility with unbounded richness of sculpture, and containing, in many instances, chambers and galleries for retreat during the oppressive heat of midday."